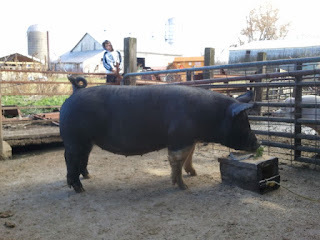 Husband is offering some of his bred gilts (young females who are pregnant) in an upcoming auction, so the men took my phone out to capture some of these beauties for purposes of promotion. Like many of us, these females were not too keen on being photographed in their time of bodily change, but I think Husband and Ryan did a good job. I just love the little Justin photo-bomb in this one.